Each collection is between £30 and £55 (plus postage), and hits all the marks in terms of being sustainable, vegan-friendly, cruelty free, toxin-free, zero-waste, organic, and natural. And as an added bonus, LowToxBox has commited to plant a tree for every box sold! Well, I loved my last LowToxBox so much that I knew I would be getting another in the future. Lucky for me, that chance came sooner than I was expecting, as a while back there was an offer that meant that instead of one tree planted for the sale, there would be two! It was genuinely this act of earth love that made me order ASAP. It was not too long before my Travel Essentials Kit arrived at my doorstep, and I was just as happy about the minimal packaging as I was last time! There was no plastic in sight, and all of the wrappings were made from recycled paper and card. I also love how carefully everything was packed, as it really looked like none of the items had moved at all in transit. This is a company you can trust to get your items to you quickly, carefully, and without threatening the planet in the process. For anyone looking for a guilt-free treat, this is definitely one to get! The Travel Essentials Kit contains eight items in total (though there is an option to add a ninth item! ), and all have been picked to be the perfect eco-friendly travel companions. There is no plastic packaging found in this collection, and everything is easy to carry and convenient without compromising the environment. Plus, as always, each item is non-toxic, vegan friendly, and sustainable. There is such a good variety of items, and I love that there are toiletry staples along with more creatively driven options like the notebook! 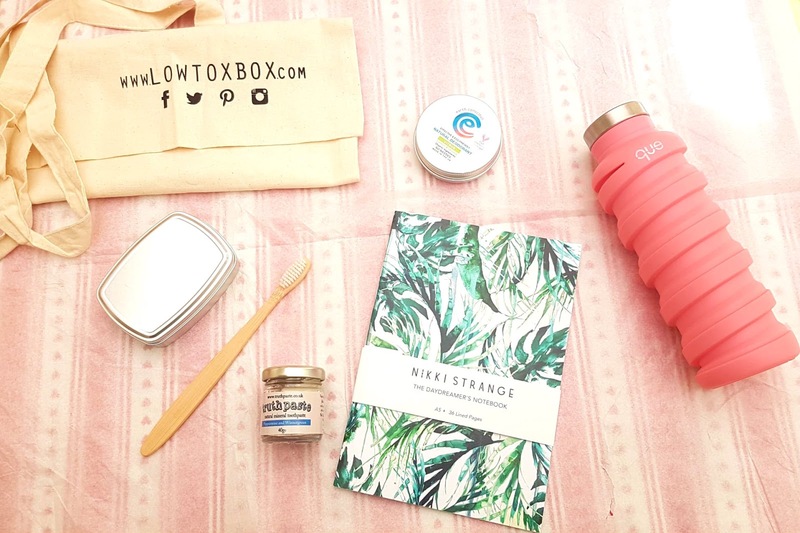 Overall I think this edition from LowToxBox has hit a home run, as this really does offer all the essentials for an environmentally minded adventure, whether that is backpacking, camping, or just an overnight trip to the city. I have to admit a big pull for me to order a second gift box was so I could get a spare Que water bottle. I have used my grey one every single day since getting my Zero Waste Starter Kit, and I thought it would be great to have a back up for washing days or longer adventures that require lots of water. The bottle is so interesting, as it can collapse down from 20oz (568ml) to 12oz (~340ml) for simple transport. The 100% BPA and plastic free container can contain both hot and cold liquid since it is made from food grade silicone, and is super light weight, flexible, and leak proof. There are six colours to choose from, and this time I opted for the pink and white option as I thought it was nice and cheery. Plus I thought I would never manage to lose something so bright! Since I have been using my slate shade bottle for so long now, I have decided that it is definitely the best reusable I have come across. I can pop it in my backpack or bag and not notice any extra weight, unlike the glass bottles I have previously used which felt like I was lugging around a brick. While it can be tricky to wash if you do not have a dishwasher, I find if you fill it with warm water and a bit of gentle soap, let it sit, then shake it vigorously before rinsing, it effectively cleans the nooks and crannies inside. 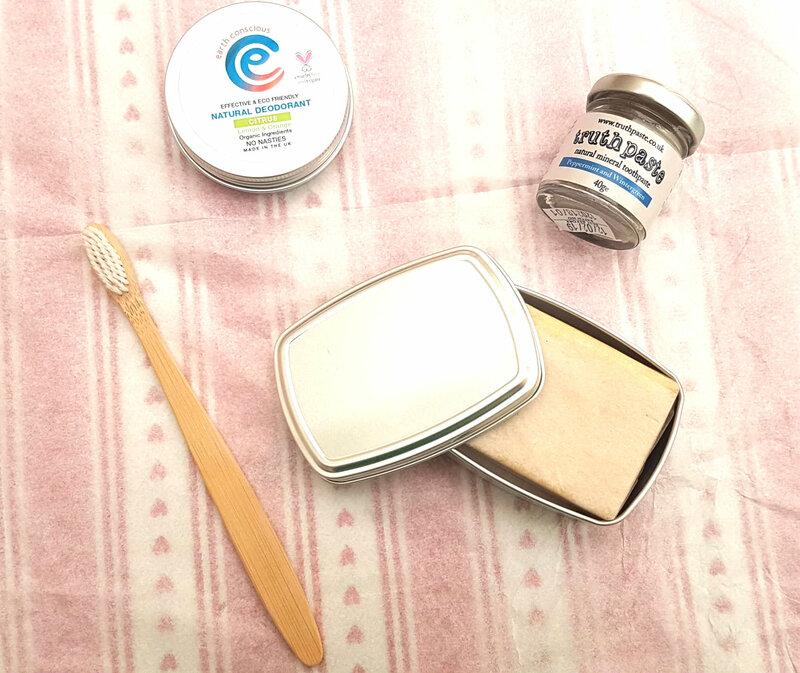 The other two products I was most looking forward to trying out were the bamboo toothbrush and the Truth Paste, as I have been searching for plastic free dental hygiene items for a while now. The toothbrush is ridiculously light, and almost feels like you are holding a twig, so I was not sure how it would actually cope when it came to daily use. However, I have to say I have been impressed by how it is holding up so far! The bristles are made from nylon, but they can be removed when it comes time to change brushes. I would say they are in-between a soft and a medium brush, so would be good for both sensitive gums and someone looking for a bit more oomph. The handle itself is fully biodegradable, and since bamboo is able to grow so quickly, the material is also one of the most sustainable options on the market. The Truth Paste was not exactly what I was expecting, as it is a clay-like consistency due to the calcium carbonate and bentonite. It is a little grainy, but this is actually a good thing as it helps tackle plaque build up and remove any food particles. The clay also works to remove toxins from the mouth, while the essential oils kill bad bacteria, regulate the natural pH levels, and add a pleasant taste. The formula is free from SLS, fluoride, artificial colourings and ingredients, bleaching agents, and other common nasties, so this is an option for someone who is looking to clean their mouth and teeth without any added bells and whistles. 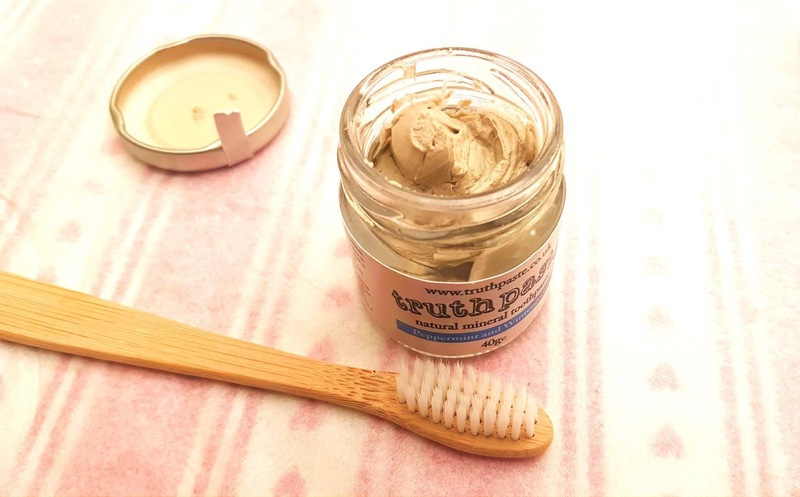 The toothpaste is truly a paste so takes some getting used to both for the feel of it in your mouth (don't expect any foaming action with this all natural product!) but also applying it to your brush. You use about the same amount as a high street option, but apply to a dry brush by either scooping some out with a spatula or spoon, or rubbing directly from the jar onto the bristles. I found the second option less of a faff. I have to say I am impressed by this so far, and I will definitely be repurchasing in the future! 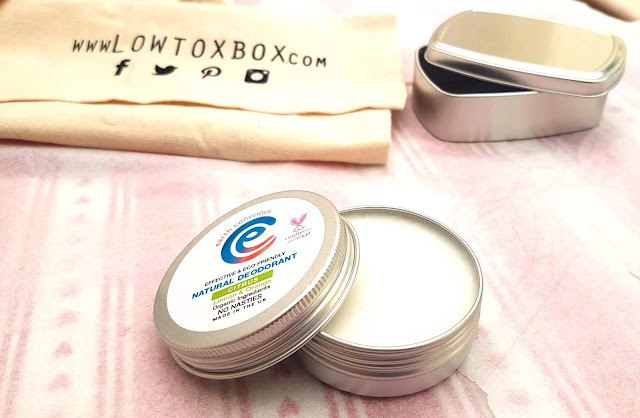 I have seen Earth Conscious on Twitter and Instagram for ages, so I was thrilled to get a pot of their organic natural deodorant in the LowToxBox Travel Essentials Kit. This product is free from aluminium, parabens, carcinogens, and other nasties, but is just as strong as a traditional deodorant. The citrus scent is really uplifting and lasts for ages, and in terms of effectiveness, I have to say this ranks up there with the best deodorants I have used. The formula is not grainy like some of the others I have tried, which means it goes on smoothly and without any irritation. For me, a single application works all day without the need for a touch up, but I am not a super sweaty person generally. I have heard from others who do have more 'active' underarms that this is their go to natural deo, so it seems to suit a big range of needs which is great! The Friendly shampoo bar is fantastic and one of the more affordable plastic free hair products out there. I have used this in the past and loved it, and find it lasts ages -- a few months at least depending on how often I am washing my hair. They have two options: Lavender & Tea Tree and Lavender Geranium. I prefer the second as it smells lush and is more ideal for the dry ends of my hair. Since it does last so long I still have a few in the cupboard that I bought during my last haul, so I requested not to be sent another. I hate wasting products, and I try my best to make sure that never happens. Best to use up what I have first before ordering more! I have to say that I love how the travel soap container fits the Friendly shampoo bar perfectly. It is a great pairing for this box, but I found it can also fit slightly larger soaps which is nice for long trips. The tin is made from aluminium so is really lightweight when empty, and is ideal for popping in a travel bag to keep your clothes protected from soapy residue or from smelling of essential oils. If you aren't needing a soap container, you can use it for loads of other things, like packing up a mini sewing kit, storing emergency cash, or carrying a grab and go snack! Another one of my most used items out of this Travel Essentials Kit was the Nikki Strange notebook - I have been using this to jot down my ideas and write myself little reminders, but I am thinking it will also be a great place to start planning future trip ideas. The pages are lined which is great for organization, and the design on the front is just so tropical and exciting it makes me wanderlust for sunnier places hard. I really like that the pages are made from recycled paper stock, meaning I am not contributing to the cutting down of trees, and the inks are vegetable based which is great for the environment. No extra toxins will be seeping into the soil because of me thank you very much! If you are ready to head out on your trip, you can stash all these travel items in the lovely LowToxBox tote and either carry them to have in easy reach or wrap them up for safe storage in your luggage. The natural cotton reusable bag is really sturdy I have found since I have been using mine for carrying shopping from the market and green grocers -- the amount of veggies, beans, and grains it can hold is honestly amazing. Overall I am so pleased with my experience with LowToxBox and found that they created yet another perfect gift collection with the Travel Essentials Kit. You do not have to be a travel fiend to get use and enjoyment out of this, but it is also a great out of the box (well, sort of!) idea for anyone you know who does love to get out and about. The edition cost £35 and has an overall worth over £48 (I could not find the price for the soap dish, so it contains a minimum RRP of £48.41). I am once again more than happy with both the price of the box and the quality of the contents, and will be looking forward to seeing what other kits they bring out in the coming year. These boxes sound lovely and I like the fact that all the products are eco friendly. Hats off to companies who are thinking of our environment. I really love the sound of the que water bottle as it's brilliant that you can collapse it down if you need a little more room. The bamboo toothbrush is a great alternative but I must admit I would miss the electric element of my toothbrush. the water bottle is seriously game changing! I really need to try Earth Conscious! I've been wanting to try them for a while! I tried the subscription box from them and I did like it. But to be honest - I like the idea of gift boxes even better! it is such a fab idea I agree! no plastic in sight and a tree for every box sold, can't get better than that!